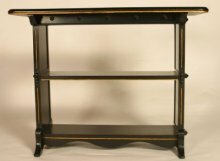 A rare three tier ebonised and incised parcel gilt side/library table, in the manner of Dr C. Dresser, superbly made with through tennon details and carved star details below the top. Height 28", Length 36", Depth 16". 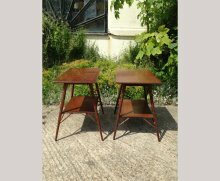 A pair of good quality Anglo Japanese/Aesthetic Movement two tier side tables with turned angular supports. Made by Jas Shoolbred of Tottenham court Rd. Left hand one Height 24 3/4" Length 27" Width 55". Right hand one Height 24", Length 26 1/2" Width 16 1/2". Circa 1880. Height 32", Width 15", Depth 15". The moulded shaped top with four Japanesque fretted supports on tapered and flared legs with a moulded frieze divided into four segmented compartments and with oval paterea to each side above a cross stretcher. 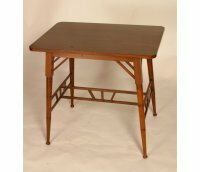 The shaped top with Anglo-Japanese fretwork supports and splayed legs united by cross stretchers are typical to Godwin The splayed legs and carved decoration inspired by simple Georgian furniture and Godwin is known to have a collection of Georgian furniture his earliest home in Bristol was furnished in “carefully selected antique furniture…. a reversion to Eighteenth century” which inspired his designs enormously. Height 25½ " 65cm , Width 27" 68.5 cm. Edward William Godwin (attributed), probably made by William Watt, an early mahogany and inlaid single drawer chess table. Height 29" 75cm, Width 19" 48cm, Depth 14 1/2" 37cm. Circa 1870's. Height 18" 46cm, Width of top 13" 33cm. 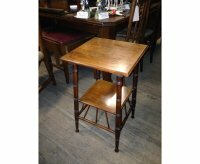 An Ash sidetable with bobbin turnings to the legs united by conforming stretchers. Height 22", Width 16", Depth 16". Height 26 1/2" 67cm, Depth 32 1/2" 83cm. Made by George Watson and Co of Edinburgh. (Lefthand 1 in the 1st picture has the label). Right :- Height 24 1/2", Width 22", Depth 22". Left :- Height 25 1/2", Width 22", Depth 22". Anglo-Japanese sidetable with original Green painted finish. Height to top of corner 26", Width from corner to corner 21 1/2", Depth from corner to corner 19 1/2". 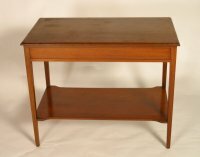 An Anglo-Japanese side table design probably made by Heals. The table is a very well designed and rare piece it has flaring ends with Gilt fretwork panels below and four shelves supported through each side in a stepped formation with gilt edges, supported on slender shaped legs. Height 26/1/2", Length 30", Depth 16". 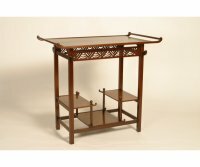 RIGHT :- Anglo-Japanese ebonised sidetable sidetable with angled turned supports and turned gallery to the lower shelf. 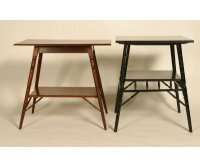 LEFT :- Anglo-Japanese Walnut sidetable. Right :- Height 25", Width 21 1/2", Depth 21". Left :- Height 24", Width 26 1/2", Depth 16 3/4". 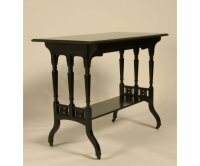 An ebonised sidetable after a design by Edward William Godwin (1833-86). Height 26" 66cm, Depth 16 1/2" 42cm. 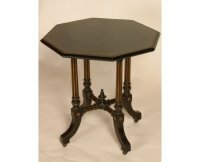 Ebonised oblong sidetable with subtle carved details and cut-outs to the base on splayed legs on castors, one can see that one front edge protrudes slightly further than the other side. Height 28", Width 35", Depth 18 1/2". 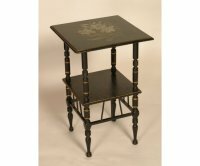 Aesthetic Movement ebonised side table with hand painted tile to the top. Height 28", Width 14 1/2", Depth 11". 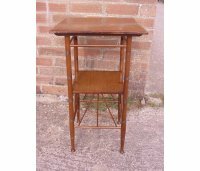 An Anglo-Japanese Walnut sidetable with revolving top and side shelves which pull out. Height 26 3/4", Depth with shelves pulled out 35 1/2", Depth with shelves pushed back under top 21 1/2". 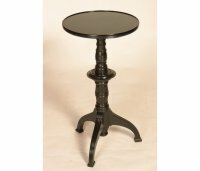 Right : An ebonised five leg sidetable with five turned stretchers united by a central disc, attributed to E W Godwin. 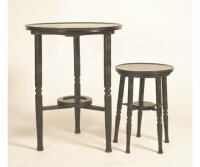 Left : An ebonised three leg sidetable. £SOLD. 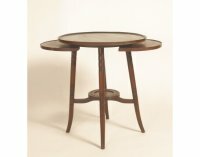 Bruce Talbert for Gillow and Co., an Aesthetic Movement circular wine table, on four turned and fluted supports with X-base, on inset casters, stamped mark, no. 8955. Height 2' 1" 58cm, Width 15" 38cm.Circa 1875. 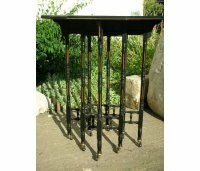 Ebonised and gilt centre table with stylised brass castors. Height 29 1/2", Depth 39 1/2". 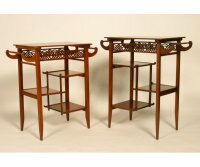 A rare pair of octagonal Anglo-Japanese side tables attributed to H W Batley. Made by Jas Shoolbred, the squaretapering splay legs with rod galleries and an undertier, one with original paper label and one stamped underneath. Height 26 65cm", Width 24 60cm", Depth 18". Height 26", Width 25 1/2", Depth 25 1/2". 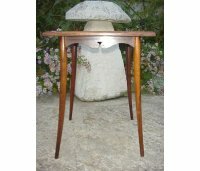 A Walnut centre table with lower shelf and cross stretcher. Height 29", Width 35", Depth 35". 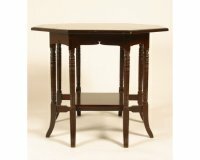 Anglo-Japanese sidetable in the manner of E W Godwin. Probably made by Liberty and Co. Height 29 1/2", Width 21 1/2", Length 31 1/2". 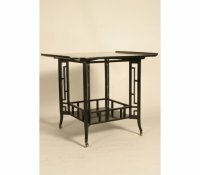 An Aesthetic Movement ebonised and brass ball inlay sidetable. 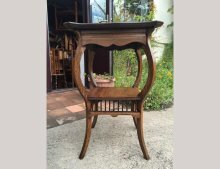 8 leg Walnut sidetable with a lower square shelf united by stretchers. Height 28 1/2", Width 34", Depth 34". The moulded top with 4 stylised cut-outs to the sides, on tapered and flared legs . 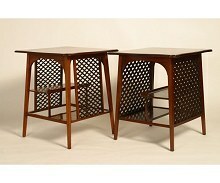 A pair of Walnut sidetables. Height 26", Width 23", Depth 16". 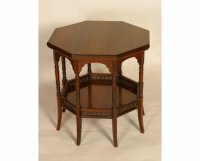 The octagonal top, with carved and shaped brackets below and turned and fluted legs united by a lower shelf with Japanesque fretwork frieze and splayed legs. 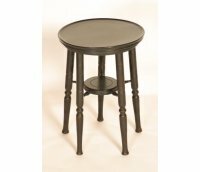 in many ways similar to his famous spider leg versions, carved details just under the octagonal top, turned and fluted legs a lower shelf with wonderful fret work details. Circa 1870's. Height 24", Width 24", Depth 24". 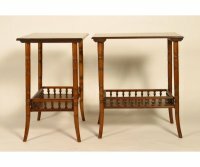 A nest of four oak side tables in the Anglo Japanese Aesthetic style, in the manner of E.W Godwin. Height 30.25" , Width 34" , Depth 13.5". Morris and Co. (attributed), two similar Aesthetic Movement ebonised circular wine tables, one with an Ashbourne marble Pietra Dura top with a flower bouquet, the other top plain ebonised, each with a shaped frieze, square section supports, an undertier with pierced gallery and curved brackets. This marble top is identical to a table designed by George Jack for Morris and Co, See Andrews, John 'Arts and Crafts Furniture' Antique Collectors Club, page for an identical Ashbourne marble Pietra Dura top with a flower bouquet. Height 25" 64cm, Width 18" 46cm. Made by Woof and Whitaker of Sheffield. A complicated yet wonderful design with good proportions, the octagonal top with shaped supports below with 8 turned and incised legs united by a double row of turned strtchers on ceramic and brass castors. Height 25", width 22", Depth 22". 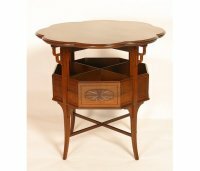 Liberty and Co (attributed), a mahogany triform occasional table, in the style of Edward William Godwin. Height 22" 56cm, Width 18 1/2" 47cm. Height to top of bar 30" 76cm, Length from bar to bar 33" 83cm, Depth 19" 49cm. 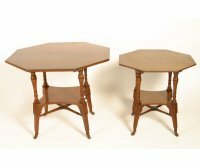 Heal and Son, a matched pair of Anglo- Japanese walnut ‘Pagoda’ side tables, See ‘Pictorial Dictionary of British 19th Century Furniture’ Antique Collectors’ Club 1977, p. 526 for an illustration from a Heal’s catalogue of 1884. Height 27", Length 26 1/2", Depth 14" 36cm. Right - Height 29" 69cm, Length 26 1/2 68cm", Depth 14". 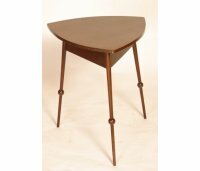 Edward William Godwin (after), a walnut square occasional table, made by Bruce and Smith, on ring turned supports with an under tier, 70cm high, 40.5cm square Godwin’s original design for these coffee tables were plagiarised by many manufacturers of the day, See Soros, Susan Weber ‘The Secular Furniture of E.W. Godwin’, p. 72, illus. 47 for the original. Height 26 1/2" 70cm, Depth 16" 40.5cm. Circa 1880. 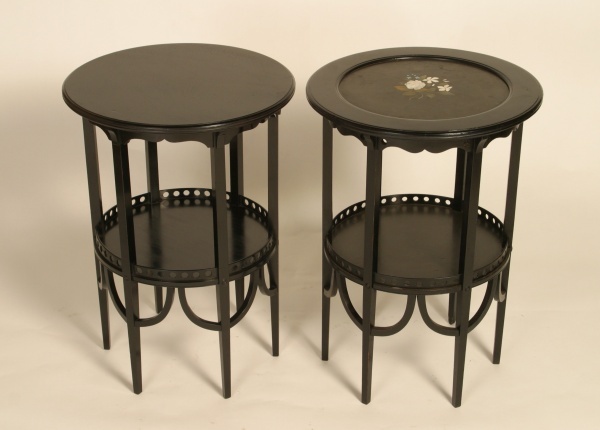 A pair of ebonised sidetables, after a design by Edward William Godwin. Height 26" 66cm, Depth 16 1/8" 41cm. 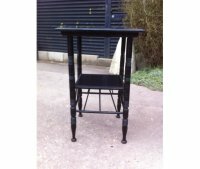 Ebonised and painted thebes sidetable. After a design by E W Godwin. 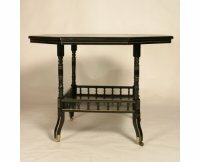 An Anglo-Japanese ebonised sidetable, a good example of a rare Japanese inspired centre table. Height 26" 71cm, Width 31 1/2" 82cm, Depth 32 1/2" 80cm. Walnut oblong side/serving table with lower shelf. Height 29 1/2", Length 36", Depth 20".